I want to be able to detect the zero point with an MCU of which pin can withstand only 3.3 V. I'll forgo optocoupler because A. I want everything to be as cheap as possible and B. I want everything as simple as possible. 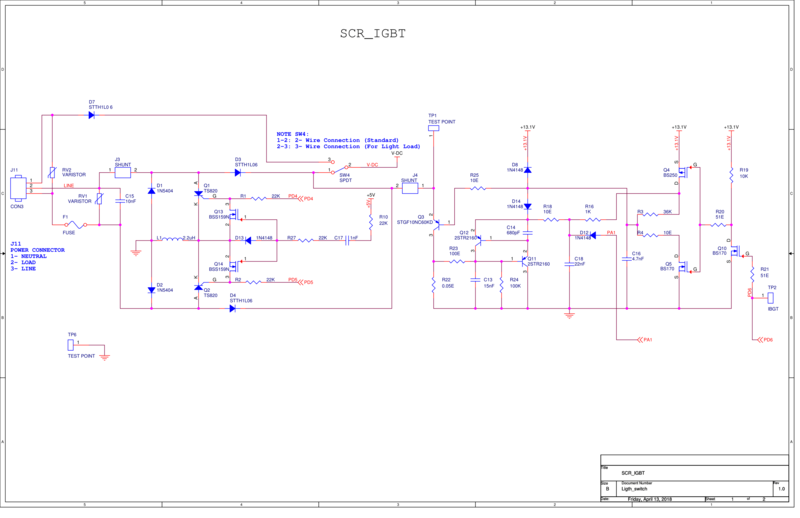 As you probably have guessed no, I don't have a 100% understanding of the schematic, so this design could very well have featured a zero-crossing detecting mechanism yet I failed to find it completely but I doubt it. The incoming voltage max will be 110V. I want to detect the zero-crossing so I can turn on and off Q1 and Q2 alternatively on a regular cycle to make the throttling of power possible. How do I do the zero crossing detection? My knuckle-dragging plan: attach one pin to a resistor 500K to limit the current, then attach the resistor to the center point surrounded by L1, Q1 and Q2 and D13, yes, that point attached to the K pin of Q1 and Q2, negative pole of D13 and one side of L1. I'll keep sampling it with ADC and decide when the zero point has arrived, at which point I'll make the switch. Browse other questions tagged ac power-electronics scr zero-crossing or ask your own question. DIY zero-crossing circuit, how crucial are component values?